A couple of friends swing a jumping rope in an industrial wasteland. They laugh and kick up the dust beneath their feet. No one pays attention to the camera. It’s a lively scene in a landscape otherwise characterised by bareness and boredom. This shot encapsulates Stefan Djordjevic’s adolescence in Bor, a mining town in eastern Serbia. Djordjevic has been making art about his hometown since he first picked up a camera. This memory, from 2013, is part of a long-term project, Kolos, named after and dedicated to his skateboarding crew and “second family”. As of yesterday, this body of work is on show for the first time at the U10 art space in Belgrade. “Growing up in a small industrial town doesn’t offer much,” the photographer recalls. 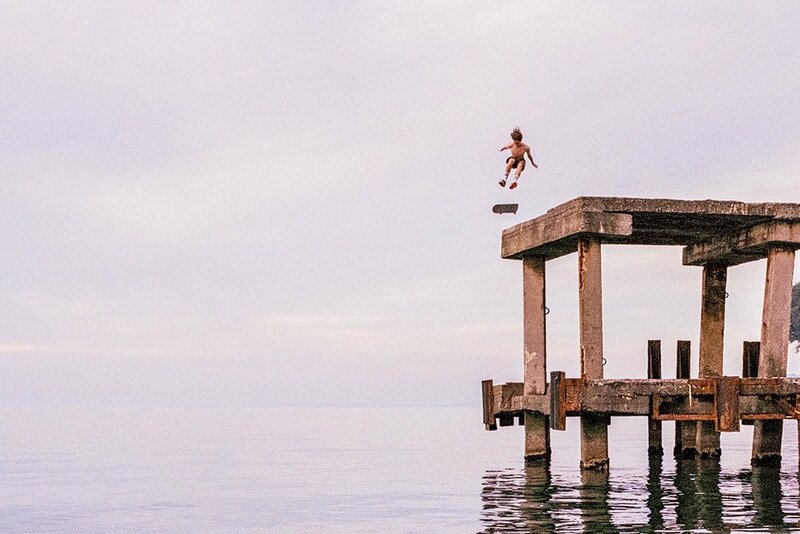 “For all of us, skateboarding and other extreme activities were a sort of resistance against apathy and conformism.” Any sense of dissatisfaction is erased in Djordjevic’s super-saturated photos from this time, which capture the restlessness and freedom of youth. “All of us were different, and we took different paths later in life, but what united us the most was an enormous desire to feel more,” he continues. Djordjevic himself went on to study cinematography at the Faculty of Dramatic Arts in Belgrade, where he is actively making films, commercials, and music videos. In his personal work he’s drawn to documentary photography, with the objective to tell true stories about people. He’s in the editing stage of his next project, a photo essay about his mother’s battle with cancer. “It’s still the toughest thing that happened to me,” he says. KOLOS – Downhill Underage is on display until 6 April at U10, Belgrade. You can find more information about the exhibition here.